B. Thomas (Arlington, Texas, United States) on 5 September 2016 in Animal & Insect and Portfolio. 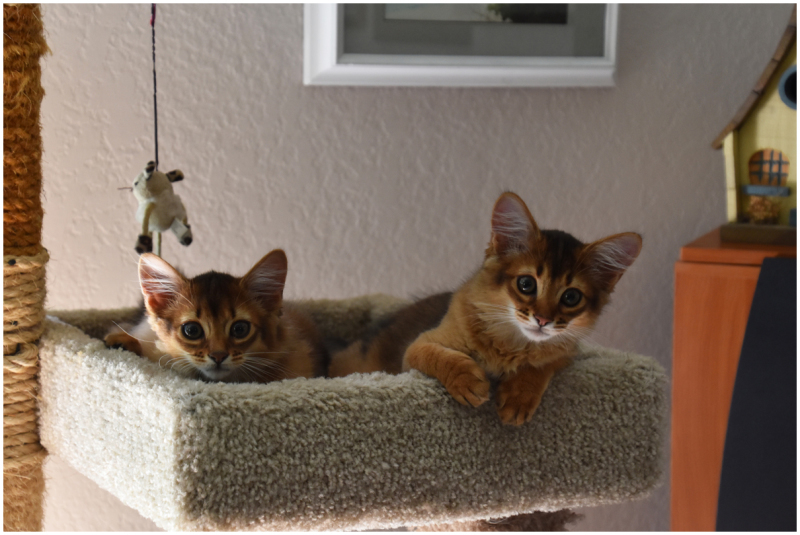 From Cat Fanciers' Association: Basically, the Somali is a longhaired Abyssinian, the result of a recessive gene in the Abyssinian cat. How this gene was introduced into the Abyssinian gene pool is a subject of much speculation and controversy; nevertheless, it happened, and the result is our beautiful Somali, for which we will be forever grateful! A recognized breed in CFA since 1979, Somalis have enjoyed many successes in the show ring. These little guys have been home with us for a week now, and we adore them! A cute capture of these two who appear to be making themselves at home quite quickly!! When I got Dexter, it took him a while before he was comfortable enough to come out of his room and condo. @Steven: We expected that, but these two were at home the minute they got here. Maybe it's because they are brothers and have each other. Or, maybe it's just the Somali cat personality. They are the cutest little critters. Very inquisitive, too, it seems. Their sighted will see that they have much to wonder at. Each day brings with it new things. And they want to try everything that they see. In front of you are the best months with them. Leevi said it would be fun to take a closer look.